Other events by . . . Unless shown otherwise, all meetings will be held in the Lower Meeting Hall of the United Reform Church, Ilkeston — entrance off Albert Street — on the first Tuesday of each month. Saturday 27th April from 10.30am to 1.00pm. Members of the public and the Society are invited to drop in with their enquiries or just to have a chat. Our thanks to the management of the venue for allowing the Society to meet on their premises. 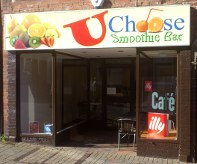 These informal monthly gatherings at the U-Choose Smoothie Bar have proved to be a success with the Society having recruited several new members, helped numerous members of the public with their enquiries and received the donation of several original photographs for use in our publications. So why not pop in if you are passing the next time we meet and see what your Society can do for you, or for that matter, what you can do for your Local History Society. There’s good food and drink and a warm welcome! So you think you know Nottingham?